I used five yards for donation pillowcases this week, and I didn’t buy any fabric. I have more pillowcases ready to go that will count on this coming week. Since I have a basket drawer where I keep juvenile/novelty/weirdo fabric that I want to use for pillowcases, I can really see the difference with this yardage pulled out. 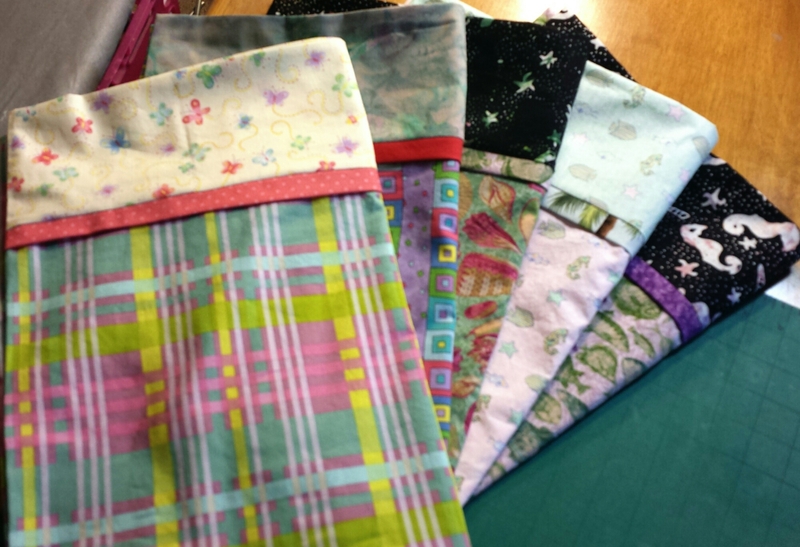 I’m cutting up the scraps, too, everything too narrow to cuff a pillowcase, and it feels like I’m getting rid of it. I know, one is never really rid of fabric. It will keep popping up again in scrap projects, but at least that basket looks better. I use this tutorial from Mama Spark, but its similar to many others, with no exposed seams. I donate mine to ConKerr Cancer. How did you do this week? Keep working away at it! Great pillowcases for a very worthy cause. Thanks for donating to ConKerr Cancer. Your pillowcases look so nice laying there. Great cause. I too am making them to donate to a children’s hospital. I had to buy some more fabric though. The cuffs are coming out of my stash, but that doesn’t make the stash go down as quickly.! Pillowcases are such a great way to use up stash. Nice to see those scrap bins getting used up!